New Charlton boss Les Reed was given an indication of the size of the task facing him as his basement side tamely went down to defeat at Reading. The home side took the lead when Stephen Hunt's clever backheel allowed Nicky Shorey to cross for Seol Ki-Hyeon to head home from six yards. Charlton rarely threatened as Reading missed several gilt-edged chances. But Kevin Doyle wrapped up a Royals win when a Steve Sidwell mis-kick let him in to touch in a shot. The new-manager syndrome can sometimes reinvigorate a team but Reed's appointment showed little impact in lifting a beleaguered Charlton. The Addicks were lethargic and, despite having two early chances against the run of play, they were fortunate to go into half-time only one goal down. Charlton striker Marcus Bent's glancing header was saved after eight minutes before Talal El-Karkhouri shot straight at Reading keeper Marcus Hahnemann shortly afterwards. But that was as good as it got for the visitors as they were constantly upstaged by a Reading side who were clearly showed more enthusiasm and zip in their play. The home side's first opening saw winger Hunt, who could easily have tumbled over for a penalty, put through on goal only for the chance to go begging after an El-Karkhouri sliding tackle. 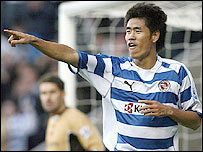 Reading did not have long to wait before their play was rewarded with a goal when Seol nodded in from six yards. Glen Little should have added a second but he sidefooted a volley wide after finding space all too easily at the far post to meet Doyle's cross. Doyle was then clean through but his failure to control the ball saw him squander away the opportunity before an unmarked Hunt headed another chance comfortably high. The second half started in the same manner as confusion in the Charlton six-yard area almost let Reading in only for the visitors to desperately clear the danger. A tame Dennis Rommedahl curler at the other end gave Hahnemann some rare work to do but Charlton failed to engineer any serious assault on goal. And Doyle pounced to add Reading's second when Sidwell's mistimed shot gave him just keeper Scott Carson to beat. The ninth defeat of the season for Charlton could have been worse but referee Graham Poll did not award Hunt a spot-kick when he seemed to be clearly fouled by El-Karkhouri. "We were worthy of the win. 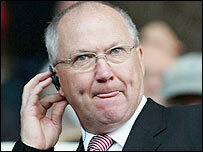 At 1-0 they were beginning to come into the game so the second goal was a relief. "Before the match it had been the first time we had been looked at as possible favourites and there were a lot of things that had made me uneasy. "But we did well and we were always a little bit ahead in every department." "We were like rabbits in the headlights. I am very disappointed with the result and I'm definitely not pleased with our first-half performance. We were very disjointed. "We have to put that right. Although we were better after the break, we still didn't create goalscoring chances. "We have got to be committed to some hard work over the next week or so." Reading: Hahnemann, Murty, Sonko, Ingimarsson, Shorey, Little (Gunnarsson 88), Sidwell, Harper, Hunt, Ki-Hyeon (Oster 88), Doyle (Lita 75). Goals: Ki-Hyeon 18, Doyle 72. Charlton: Carson, Young, El Karkouri, Fortune, Hreidarsson, Rommedahl, Holland, Reid, Thomas (Ambrose 57), Darren Bent, Marcus Bent (Sam 79). Subs Not Used: Andersen, Hughes, Ashton.